The phrase "you are what you eat" is never more true than when you're pregnant and breastfeeding. Your baby is, quite literally, made up of what you as a mom eats. Your body takes the food that you eat, breaks it down into the building blocks that make up your baby's muscles, bones, and brain. And in some cases (like with Calcium), if you aren't eating enough, your body will actually start taking nutrients from your storage to give enough to baby. 1. Take your prenatal vitamin. Every day. Ideally, you should start taking a prenatal vitamin before you become pregnant, especially since most of us don't realize we are pregnant until at least a few weeks in. Prenatal vitamins contain essential vitamins and minerals, like folate and iron, that support a growing and developing fetus. Talk to your doctor or midwife about what brand is right for you. Sometimes your doctor/midwife will suggest you take more or less of a certain nutrient (for me, I had to take an extra iron supplement because I was anemic). There are also some prenatal vitamins available now with omega-3 fatty acids, which may help support baby's brain development (you can also get omega-3's from certain fish and other foods, but for those of us who don’t eat a lot of fish, taking it in your prenatal supplement can be a good choice). Some women feel nauseous after taking their prenatal vitamin. If that happens to you, try taking the vitamin right before bed and with a snack. Some women also experience constipation, which can be caused from the iron in your prenatal (and just from pregnancy itself!). For that, make sure you are drinking enough water (see #2), and eating enough fiber (see #3). If you're breastfeeding, talk to your doctor about continuing to take your prenatal vitamin. Many of the nutrition needs during pregnancy are the same for when you're breastfeeding, so taking a prenatal vitamin can be a good way to ensure you are getting all the nutrients for your growing baby. Think about how you can achieve a goal of taking your prenatal vitamin every day. Try setting an alarm on your phone, or leaving the bottle of vitamins on your nightstand so you take your vitamin right before bed. Read more about prenatal vitamins here and here. When you're pregnant, staying hydrated is necessary for both you and your baby. For one, your body makes extra blood, which is mostly water. Also, your body is making amniotic fluid, also mostly water. With all those extra fluids in your body, you need to drink more water than usual to maintain them. There are also the fun pregnancy adventures like constipation, UTIs, and swelling (woohoo!!). Staying hydrated can help prevent and treat all of these. If you're breastfeeding, believe it or not you need even MORE water than when you were pregnant. Your wonderful, amazing, life-giving body is producing about 1 liter of breast milk a day (wow! ), and breast milk is, you guessed it, mostly water. So, how much water should you be drinking? For pregnant women, the recommendation is 8-10 glasses a day (8oz glasses), and for breastfeeding women, it's 10-12 glasses a day (8oz glasses). Keep a reusable water bottle with you at all times so you can sip often. If you feel thirsty, you need to drink some water. Thirst is a sign you are dehydrated. 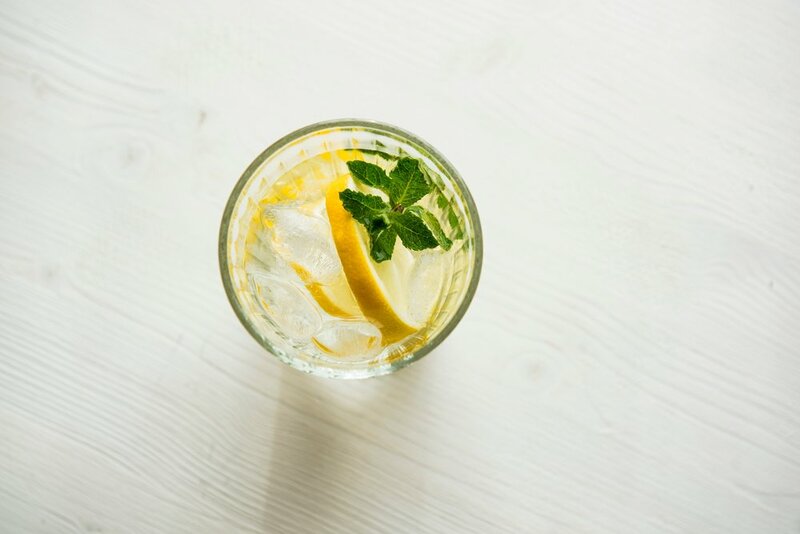 Don't feel like you need to drink just plain water. Decaf tea and coffee, seltzer, and flavored water count too. Just try and avoid drinks with sugar added to them, like soda and juice. Look at the color of your pee. It should be pale yellow to nearly clear. If it's medium or dark yellow, that's a sign you need to drink more water. Since you will pee about 100,000 times a day while pregnant, you may want to stop drinking water or only take very small sips after dinner. Try and get your 8-10 glasses in during the morning and afternoon so you can take it easy and hopefully make it through the night with minimal few bathroom trips. Read more about hydration during pregnancy here. Many women don’t have any trouble eating enough fruit when they are pregnant and breastfeeding, but veggies are a different story. Setting a goal to eat at least 3 different kinds of veggies every day will help make sure you are getting the vitamins and minerals for you and your baby, as well as the fiber to help keep constipation at bay (isn't pregnancy grand!). Every vegetable contains a different mix of vitamins, minerals and antioxidants, so choosing a variety will help you get a full range of nutrients. One trick is to try to eat as many different colors as you can. The different colors in vegetables are from antioxidants. Antioxidants help protect the nutrients in your food and may also prevent disease. Read more about antioxidants here. Start small, set a goal to eat 3 different veggies a day. Then, once you've reached your goal, add in another challenge, eating 3 different colored veggies a day. And if you're feeling really adventurous, set a goal for yourself to try one new vegetable every week. Eating a wide variety of foods actually changes the taste of your amniotic fluid and breastmilk, so it may help your baby become a more adventurous eater when they're older (read more here). Protein makes up so much of our bodies, especially our muscles, so when you are pregnant or breastfeeding a growing baby, it's important to eat enough protein to give your little one everything they need to grow big and strong. Try setting a goal for yourself to eat one high protein food with every meal and snack. A little goes a long way with protein, so don't feel like you need to start adding protein powder to your oatmeal or have meat with every meal. It's all about balance, and you don't want to go overboard with protein that you miss out on fruits, veggies, and grains with your meals. Read more about protein needs during pregnancy here, here, and here. When you're pregnant, your immune system is weaker, and you are at a higher risk of getting food poisoning. If you do get food poisoning, it may be worse when you're pregnant and it can be dangerous to you and your baby. Cook foods thoroughly to the proper temperature (165 F for chicken, turkey, and any ground meats; 145 F for pork, beef, veal and lamb that is not ground, 145 F for fish, and 165 F for reheating leftovers; read more here). Use a meat thermometer instead of guessing. When heating up leftovers, make sure they are heated thoroughly (to 165 F) and let them rest for a minute or two, covered, before chowing down. When you have a newborn, their immune systems are also weak, so it's important to practice safe cooking to help make sure they don’t get sick from something you touched. If you're breastfeeding, all those foods above are now ok to eat (YESSSS!!! ), but you should still follow safe cooking practices at all times. Read more about food safety during pregnancy here. Share your stories! Let me know your best tips for staying healthy while pregnant or breastfeeding.